Above: Rag and Bone Dre Jeans, an old tunic from Nordstrom (similar ones HERE and HERE) and Eric Michael Izzy Sandal in Slate. Happy July, lovelies! Last month, I discussed my new found love for the Rag and Bone Dre Boyfriend jeans (also available at Shopbop, Nordstrom, Revolve and Neiman Marcus). Since then, I have been wearing this style nonstop as it is equal parts current and comfortable. I have this particular cut in size 24 and 25 and wear them interchangeably for a fitted yet relaxed vibe that works just as well with sandals (as pictured above) as heels. Above: A closer look at the Eric Michael Izzy Sandal in Slate...all the benefits of a Birkenstock with a couple extra inches of height = brilliant! 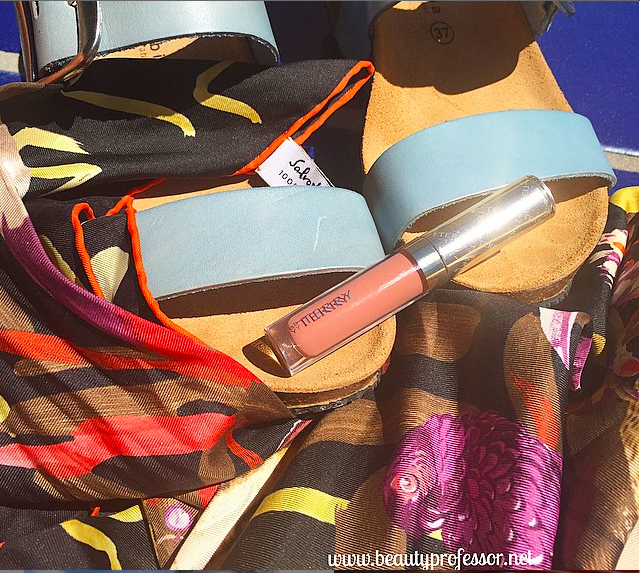 Also pictured, my favorite By Terry Velvet Rouge in Lady Bare (also reviewed HERE) and a Ferragamo "Funny" scarf that is always in my handbag! Bottom Line: I simply adore the Rag and Bone Dre Boyfriend jeans (also available at Shopbop, Nordstrom, Revolve and Neiman Marcus) and highly recommend them as the perfect, casual companion to summertime heat. Good things ahead...I am currently just putting the final touches on my June 2015 Favorits video...should be live later on tonight or first thing in the morning! !